Artist Trading Cards and ACEO's, a new way to make and sell your art. Don't miss out on new articles, tips and demonstrations! You can sign up for my news blast on this page. You'll get monthly advice and inspiration to improve your paintings. Join our community of over 3000 strong! 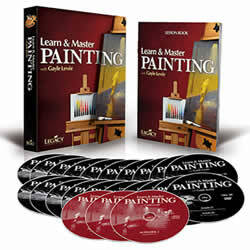 Or check out this great opportunity to better your painting today! So lets talk about miniature works of art known as Artist trading cards (ATCs) and Art Cards, Editions and Originals. These are works of art on a miniature scale. The exact size, and the one rule about them, they must be on a support that measures 2.5" by 3.5". This is the same size as your standard baseball trading card. A M. Stirnemann has been credited with getting the movement going by holding card trading events in Zurich Switzerland in 1996-1997. Oh yea, the other rule about ATC's is that they are ONLY TRADED. Like a big swap meet. Now, artist's being the enterprizing folks that we are decided that we should be able to make a dollar by selling these things. These are now called, Art Cards, Editions and Originals (ACEOs). At present, there seems to be much confusion as to who started that movement, so rather than go down that road, lets just talk about how to make them in more detail. Remember, there really is only one rule concerning an ATC or ACEO. It has to be 2.5" by 3.5" in size. 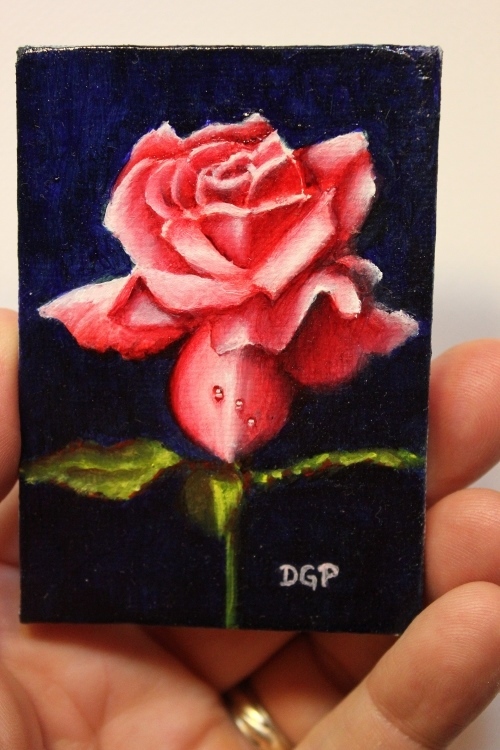 The photo below is of a recent ACEO that I've painted. Included is a ruler so you get a better idea of what its size is, and some of the really small brushes used in it's creation. 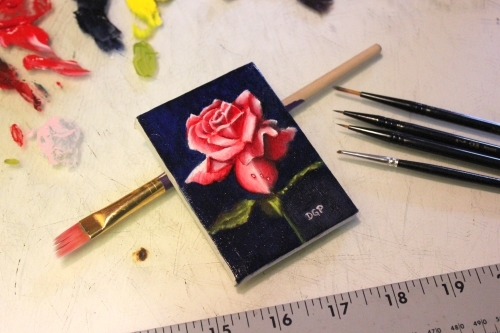 The artist trading card (ATC) or ACEO can be in any medium, paint, colored pencil, ink, watercolor, acrylic and oil paint. They can be produced on any support, wood, clay, fabric, metal, canvas, Bristol Board, or masonite. You just want the support to be a bit stiff so it can hold up in the future and not be bent to the point your paint or media that was used is cracked. They can be matted, framed or placed on their own little easel or stand to be displayed. I've seen some framed with a wide 3" and 4" frame that really brought these jewels to life! The brushes that are typically used will mostly be small, and very small. We're talking "0" to "0000" in size. Oh, and a magnifying glass. Now for a few more small points to remember. If you're painting an ATC, ACEO with oils, your framing will not require glass. Any other medium, you will need to protect the work with glass if framing it. It will also need a matt to keep the glass from touching the surface. If you are going to display your ATCs, and ACEOs in a regular trading card binder, with traditional trading card sleeves, just remember the thickness of your support will be limited. These albums or binders are like any scrapebook album except the pages are set up to slide the ATC into a small pocket. You may also need to seal your art so that the loosely fitting sleeve doesn't rub your hard work away. There are also Cases (rigid sleeves) available to showcase the work in. Always ship them in some sort of protective sleeve. Since they are small, a flat rate shipping charge that isn't too expensive works great. Sign all of your pieces, even reproductions. You can also include an artist bio, artist statement, or certificate of authenticity. Put your statement on the same sized card so it can be kept behind with the art. Click here to head back to the top of our Artist Trading Cards page. Click here to see a demonstration of several ACEO's! Did you enjoy, or learn something from this page? Why not create some good Karma, and pass it on? Facebook like us, Pin the images you love, or Google + and let others feel the warmth! Click below to follow me on Pinterest! Put your email above and subscribe now! Home | Site Map | About Us | Privacy | Disclaimer | Contact Me!